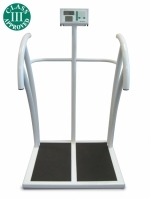 The Marsden 800 is a set of high capacity bariatric weighing scale. It has hand rails to help to provide reassurance to unsteady users, and larger base to accommodate all different shapes and sizes. It has two displays - the top one displays users weight, while the lower one is capable of providing an automatic BMI (Body Mass Index) calculation - and is easy to use and read. Just turn on, enter user height (if BMI calculation required), and the weight is clearly shown on the top display. The display panel can be lowered or raised, depending on user height. The 'Hold' feature can be activated before or during weighing, and will retain the user weight until reset (by pressing the 'Hold' button again). This Premium Class III high capacity scale has a substantial platform and is of a durable heavy duty construction.